Celebrate “Galentine’s Day” with French Wines & Fondue #Winophiles – What's in that Bottle? To me, Valentine’s Day is for sharing great wine and food with the ones you love, whether they’re friends, lovers or family. This year, I hosted a fondue party because, why not? But after a snowstorm forced a few guests to cancel, it turned into a “Galentine’s” fondue party for four girlfriends on a frosty Friday night! It may not have been romantic, but it was fun and delicious. And a little chaotic! And that’s about as much wine input as I cold muster. So the impressions are pretty much mine (and really my friends will drink anything, so, whatevs.) This was a fun way to explore some special wines from France – the land of romance! – and Valentine’s Day provided the perfect timing. The French Winophiles group of bloggers will gather this Saturday morning, Feb. 17 on Twitter at 10 a.m. CST to chat about romance, France and wines. Join us! Just use #winophiles. 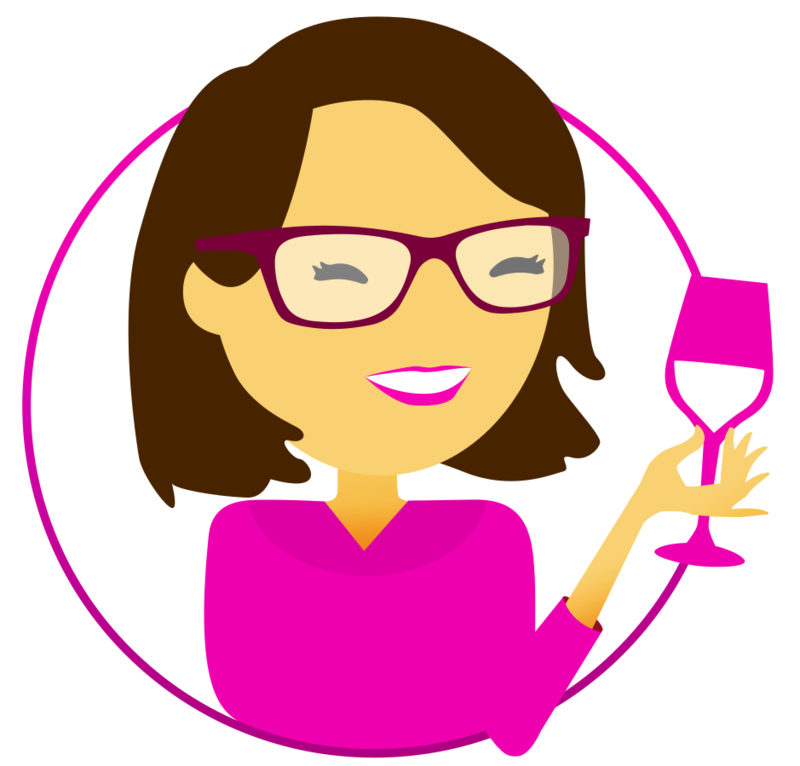 But because this is a wine blog, let’s talk about what’s in those bottles, shall we? Thanks to Lynn Gowdy at Savor the Harvest for coordinating four delightful samples. ♥ Pure Loire Rosé d’Anjou 2016: We started with this pretty rosé in a very distinctive square-shaped bottle from Famille Bougrier. Made from 50 percent Grolleau and 50 percent Gamay, it has the signature strawberry nose of rosé, and a fresh and fruity taste. It was good with the fondue, but I think it would be even better with something spicier, like Thai or Indian food, as it had a bit of sweetness to it. $15. ♥♥♥ Savoie Cuvée Gastronomie Apremont 2017: Holy what the what? This wine is made from a grape I had never heard of – Jacquère – and comes from an appelation that was new to me – Apremont — and it was DELICIOUS! Made by Jean Perrier et Fils, in the Apremont commune of the somewhat lesser-known Savoie wine region, in Eastern France (south of Jura and north of the Rhône), this white wine was light-bodied and fresh and sassy, with appealing notes of lemon and a flinty, minerally edge. It was an excellent pairing with the cheese fondue and at $11 retail, I would buy this by the case! ♥♥♥ Vignerons de Bel Air Saint Amour Cru Beaujolais 2016: This 100 percent Gamay from the Saint Amour Cru of Beaujolais was really fun. Fresh n’ fruity, it sang with red plums, tart cherries and a little black olive note. Roger Voss from Wine Enthusiast just gave it 87 points – I would give it more! $19. ♥♥♥♥ Trimbach Pinot Gris Reserve 2012: Thanks to my friend Carla for bringing this beauty from Alsace – it’s a classic fondue wine! It’s got a richness to it, and a beautiful frame of acid that makes your mouth water, with stone fruits, like apricot and peach and a little bit of almond. Divine with cheese fondue! $21. Meat Fondue: Heat 2 1/2 cups of canola oil in your fondue pot until it is, uh, pretty hot (sorry, I did not get a temp on it). If it starts smoking, it is too hot! I cut up two beef filet mignons into bite-sized pieces and seasoned them with salt and pepper. Bite-size pieces of meat will cook in less than 20 seconds. We also did blanched broccoli and cauliflower in the hot oil – pretty delicious. Cheese Fondue: I used this recipe from Epicurious. After you set your pot over a Sterno flame, if it gets too hot, extinguish Sterno and relight as needed. Also, I subbed Sherry for the Kirsch. To dip: blanched cauliflower, broccoli, tiny boiled potatoes, cubes of bread, crisp apple slices, pretzels. I mean, come on – what’s not good dipped in melted cheese? Chocolate Fondue: Warm 1 cup of heavy whipping cream in a double-boiler. When it is warm (but NOT boiling; just when you see small bubbles forming on the edges), add 8 ounces of chopped chocolate and stir until chocolate melts and cream is incorporated. To dip: squares of pound cake or angel food cake, marshmallows, sliced bananas, whole strawberries, chunks of fresh pineapple, candied orange peel, graham crackers, shortbread. See note about melted cheese – what’s not good dipped in melted chocolate? Check out these French #Winophiles posts, too! Fun! And yes sounds chaotic too! Sue and I keep talking about doing a fondue party — the last one I did was years ago for a birthday — chocolate and cheese! We weren’t trying to get wine tasting notes however! I’m loving cheese and chocolate fondue – but I’ve never gotten into the oil/meat version. This looks like a fun night with pals! What cheese did you use? I used a 50/50 mix of Gruyere and Jarlsberg. Delish. I grew up with the hot-oil version, so had to include that, too. I think this is a great way to spend any day! Sharing good food and wine with friends is the what life is all about! Delicious chaos is my favorite! Now I need to dig out my fondue pots from the depths of storage. We’ve moved three times since I last saw them. Hopefully they didn’t get shuffled off to Goodwill by my well-meaning, decluttering spouse! Oh, I haven’t had fondue in such a long time – and now I want some! Your party sounds like a blast. Sometimes when plans go awry, what happens in their stead is even better. ANd I’m with you – totally blown away by the Jacquere. What a fun party. I have found the same thing when I have tried wine tasting during dinner parties. It is very hard to expect people to be focused when they are busy having fun. Thanks for sharing your thoughts. I had to smile at your friends’ wine input. I’ve gone as far as having tasting sheets to fill out and the usual response is pretty much exactly what you had. No matter, the wines obviously contributed to the fun and mayhem! Resentful vegan drooling over the fondue…can’t wait for a chilly day to try this! Cheers, Liz. How fun Liz! Fondue is such a great party dish… love the conversation that seems to take place around the pot. And as wine is consumed, it gets better and better. The Jacquère! Yes! I love the fondue them Liz. What fun. I also love that Trimbach Pinot Gris. Thanks for a great read! Sounds like a great time! I’m another fan of that Trimbach Pinot Gris, as well as the rest of the lineup you tasted. Mmmmm It all sounds so tasty – I love fondue! And such a fun night. Love nights like that with my gals!